Serenity Central: Get cozy in the woods! Historic Gold country! I welcome long and short term stays and will be happy to work with you on arrangements. Discover your own personal sanctuary. Whether you're looking for a romantic getaway, a place to regroup and reinvent your life, write the great American novel, or maybe just find a fabulous napping haven and chill out, this could be your nest. Whatever you wish, it is truly serenity central. Surrounded by pines and cedars, this beautifully furnished home welcomes the exhausted traveler or escapee from the stress of urban life. You will have a sweet bedroom with Queen bed, a full bathroom, a cozy living and dining area with a wonderful fireplace and a completely equipped kitchen. It is perfect for a couple at $175/night. Winter offers snow retreats, snuggling near the fire and maybe some cross country skiing. Downhill skiing is about 45 min directly up I 80 at Borreal or a bit further into Tahoe country. With easy access off I 80, this is the perfect location for Sierra adventures. In the summer, a community pool awaits within walking distance. Town is a brisk 15 min walk down the hill The historic Dutch Flat Hotel offers breakfast and lunch, and the Monte Vista Inn offers a spectacular local watering hole and fabulous dining experience. A private catering service is also available and offers gourmet meals delivered to door. Hiking, fishing and exploring old gold country haunts and antiquing are just part of the fun. We are free lance writers and video producers. This is a fabulous place for creativity and exploration. Since we write worldwide, Serenity Central is filled with photos from many cultures. The Sierras are spectacular all year round. It is a perfect place for nature, hiking, winter and summer sports and just plain chilling out. Exquisite nature is one of our favorite benefits. No freeway traffic jams while enjoying pure relaxation. This is a perfect writer's haven. 2 bathrooms. Both have bathtubs. Upstairs has shower as well. Dutch Flat is a wee village with a trading post and post office. The old Dutch Flat hotel is opposite the Trading Post. Landline for local calls only. Cell phones may or may not work in house, but work at top of hill near tree. Texts work at kitchen counter. Two propane stops in front room and downstairs. Turning on fan circulates heat. Electric throw. Propane stoves. Please do not adjust any dials at stove. Thermostat is on wall. Leave at lowest when departing. In winter with snow, park up on Main St. near tree. If no snow, parking in cul de sac is available. Do NOT park in cul de sac if there is snow. Dial in time of cooking. Modern newly designed kitchen for ease. Has lovely window outlooks. Smart TV with Netflix, Hulu and Amazon . Please use only FREE Amazon option. Huge ecclectic collection of DVDs AND, yes, indeed, old genre collectible VHS. Massive collection of VHS and DVDs in trunk in front room. mini deck or balcony off the master. have removed furniture for winter. Take your pick, there are 3 decks......most favorite is the main one off the front room. Fabulous but open only in summer. Reiki treatments booked upon request. Very nice location and easy to get up to the ski resorts. The house was very comfortable and enjoyable. We had nice family time, nice meals and watched several movies. I would recommend this house to others as a great getaway for the weekend or vacation. I'm so pleased that Serenity Central did her job. I focus on this home being a true place of chill out, rest and lots and lots of options of movies and places to wander in the woods. Thanks for coming and always a pleasure to have you! Serenity Central was a fantastic home base for exploring the nearby national parks--and the fantastic, local Dutch Flats community pool. The property was spacious, cozy, stocked with anything you might need (and more), and offered indoor and outdoor space. We especially appreciated the grill on the upstairs deck, which made our Labor Day adventure complete. Add to all of this the overall spiritual, supportive vibe of the decor, and you have a truly special place to stay. Communication about the property and details for check-in and out were fantastic. I really appreciated the print outs waiting for us at arrival, with lots of information beyond just the property, but also the local town and nearby things to see. We couldn’t have asked for a more inviting place to stay. The house relieved us of any stressors we’d brought with us as soon as we walked in. It was a perfect place to read, watch a mystery or two, complete a few crossword puzzles, and catch up on sleep. Everything we needed was there, and the owner was very accommodating before, during and after our stay. We had the best time at this relaxing comfortable cabin. Close to an awesome pool with nice families and a fun walk into town. Many different sounds of birds, squirrels, chickens and trains are a welcome change from city life. This uniquely decorated home is the perfect destination for someone wanting a short drive from the valley to a relaxing stay in the Sierras. 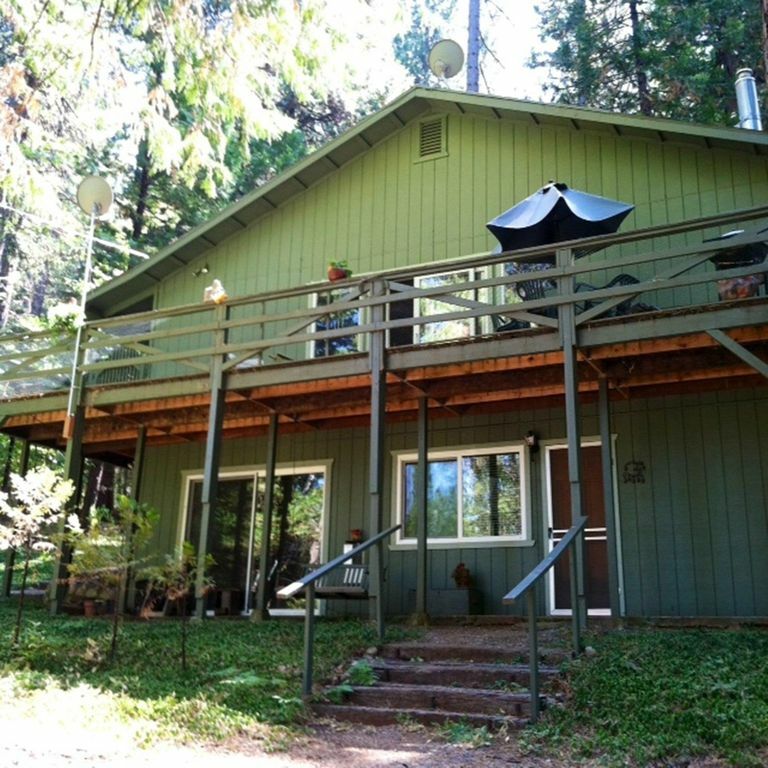 The house is light and airy with forest views from every room and the wonderful fenced deck on the upper level is great for children, pets, bbqs and just unwinding in a forest setting. If you want a little more adventure the area is perfect for hiking, and if you have off road vehicles there are miles of dirt roads to explore in the area. The owner is enthusiastic and accommodating . I so enjoyed my three days and nights at this simple yet elegant cottage in the magical setting of the silent sentinals of the Sierra. There is a feeling of "leaving it all behind" as one slips out of the hubbub of the valley and into the welcoming comfort of this beautiful natural environment. Contributing to this sense of comfort is the cottage ambiance; the warmth of the dancing fire, the starlit views from the ample deck, simple fare from the well detailed kitchen, and I recommend a good friend to share it all with. This is a great getaway for a three "*r" destination (rest,relax and retreat). Enjoy! Snow skiing about an hour away. Fabulous community pool open in summer, less than a block away.